Featuring a distinctive body design to accommodate its six 123A lithium primary batteries, the M6LT-B also incorporates an oversized 2.5” Total Internal Reflection (TIR) lens to produce a long-reaching beam. An equally oversized tactical tailcap switch is used to activate the single output mode. The Manufacturer’s Suggested Retail Price (MSRP) is not yet listed but should be in the neighborhood of $455. Retailers are beginning to show the M6LT-B in stock with street prices of around $320. 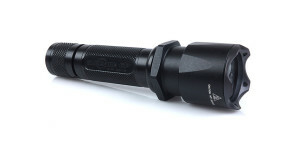 A sample of the M6LT-B Guardian was provided by SureFire for the duration of this review. The M6LT-B arrives ready for service with a full complement of 123A batteries, the battery magazine (installed in light), lanyard, and removable lanyard ring along with a User’s Manual and assorted paperwork. Featuring all aluminum construction, the M6LT-B measures more than 8” in length and weighs in at over one pound with batteries installed. All exterior surfaces are hard-anodized for resistance to corrosion and wear. The anodized finish has a consistent and even appearance across the entire light. Deeply machined grooves and knurled ridges are incorporated into the design to provide a solid grip. All laser etching is clearly legible with a very bright white appearance. A series of cooling fins at the base of the head allow the M6LT-B to shed heat from the LED and electronics when operated for extended periods of time. The upgraded KX9T-D TurboHead houses the large 2.5” TIR Lens behind a coated tempered window. Mild crenelations around the bezel will allow light to escape if the M6LT-B is turned on and placed bezel down onto a flat surface. Externally the M6LT-B is virtually identical to the previous version, the 900 lumen M6LT-A, and uses the same “open window” TIR lens. The oversized tailcap houses the protruding tactical momentary switch. 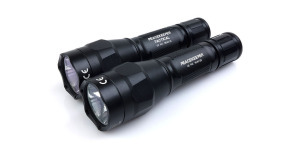 As with many other SureFire lights, constant-on operation may be achieved by tightening the tailcap against the light’s body. The tailcap may also be locked out, preventing accidental activation, by loosening (unscrewing) the tailcap approximately one full turn. The 550 paracord lanyard can be attached to the welded steel lanyard ring using the provided metal clasp. The lanyard may be adjusted with the two included cord locks. Removing the tailcap allows access to the battery magazine containing six 123A lithium primary batteries. Double O-rings at the tail help ensure a water tight seal. The polymer battery magazine is solidly constructed with oversized supports and thick end pieces. Batteries are held securely in place between heavy spring steel clips at the negative terminals and smooth contacts at the positive end. A prominent red label identifies the positive end of the magazine which is inserted into the light first (click images for larger version). Wiring inside the battery magazine separates the batteries into two sets of three, each wired in series. These two sets are then connected in parallel to produce a nominal 9 volts for powering the M6LT-B. When installed into the flashlight body, the battery magazine is supported at each end by heavy springs. A solid aluminum slug is used in the tailcap to complete the electrical circuit. The big LED emitter and TIR lens allow the M6LT-B to produce a beam with a clearly defined center hotspot effective beyond 250 yards. A large secondary hotspot also has considerable range and the broad spill beam allows a good amount of peripheral vision. The center of the beam has a creamy white tint transitioning to a cooler tint as it widens out into the spill. The following slides compare beamshots from the 1200 lumen M6LT-B and a variety of other lights to provide perspective regarding its output, beam profile, and tint. The beamshots can be compared across their full width using the slider and additional images can be accessed by using the navigation buttons in the bottom-right of each image. In addition to 123A primary batteries, the M6LT-B may also be powered by LFP123 rechargeable cells. Runtime tests were performed using Battery Station 123A and K2 Energy LFP123 rechargeable batteries to measure the M6LT-B’s performance over time. Testing was conducted at an ambient temperature of 77° Fahrenheit with no external cooling provided. With both battery types the M6LT-B provided a brief burst of extremely high output but quickly dropped to about 75% of the initial level over the first minute of operation. The Battery Station 123A lithium primary batteries sustained this lower level of output for nearly two hours before beginning a long tapering decline as the batteries were depleted. As would be expected, runtime was considerably shorter with the K2 LFP123 rechargeable batteries and output dropped much more steeply as they were depleted. The overall output level was essentially the same with both types of batteries. Thanks to its mass and effective cooling fins, the M6LT-B only becomes warm, but not hot, during continuous operation. The SureFire M6LT-B Guardian is a purpose-built handheld searchlight and little else, making no attempt to be like the multitude of compact, high-powered, blinking, flashing, and strobing “tactical” lights that are so prevalent on the market today. Rather than simply trying to be good at many things, the M6LT-B is designed to be great at one thing – providing long-range illumination for a prolonged period of time, the same goal as the original incandescent M6 Guardian more than a decade ago. The term “overbuilt” does not begin to describe the rugged construction of each component from the bezel to the tailcap. Even the internal battery carrier is impressively robust. The oversized body is comfortable to hold in an under or overhand grip and is especially well suited for use when wearing gloves. The simple switch mechanism should be practically immune to failure ensuring reliable operation, regardless of conditions. Fit, finish, and function of all parts has been fine after the addition of a small amount of lubrication to the inner tailcap O-ring. As with all too many other lights today, the M6LT-B appears to only run for a short time at its rated output before reducing power. However, even after this drop in output, it is still likely producing in excess of 900 lumens and continues to do so for nearly 2 hours. The beam manages to strike a good balance between throw and spill with the “open window” TIR optic providing considerably more spill than the earliest 2.5” TIR equipped lights. When it’s all said and done, the M6LT-B is a tool designed for a specific type of task and, as a result, is not as versatile as some other lights. However, when the job calls for a sledgehammer of a flashlight, the M6LT-B is ready to go to work. At the time of this review, the M6LT Guardian product listing on the SureFire website has not been updated to reflect the M6LT-B specifications. However, it is available for sale from some retailers. The 123A lithium batteries used for runtime testing were provided by the very kind folks at Battery Station. I have the predecessor and it’s a very robust and powerful light. Unfortunately this successor isn’t that much more powerful than the predecessor as one could expect based on the specs. That because the initial drop is much larger: ~15% drop compared to ~30%. That will be around 100lm difference during the rest of the stable runtime, and probably not noticeable during normal use. But still it’s a great light no doubt about that. I meant: ~30% compared to ~15%.